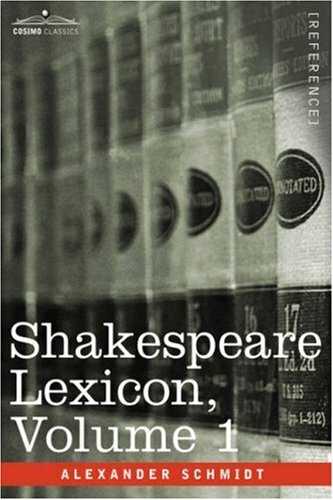 Still often used today, German schoolmaster and philologist ALEXANDER SCHMIDT's (1816-1887) Shakespeare Lexicon is the source for elucidating the sometimes cryptic language of Shakespeare and tracking down quotations. Volume 1 covers A through L, from "a: the first letter of the alphabet" to "Lysimachus," a proper name. Volume 2 covers M through Z, from "Mab: the queen of the fairies" to "Zounds: an oath contracted from God's wounds," and features numerous appendices and supplements on grammar and usage. Every word from every play and poem is cataloged, referenced, and defined in this exhaustive two-volume work, the result of arduous research and stalwart dedication. Serious scholars and zealous fans will find the Lexicon the ultimate guide to reading and decoding the Bard.